Thinning and fuels reduction are necessary treatments in today’s overstocked dry forests. But sometimes, aggressive implementation of prescriptions can degrade habitats beyond what is really needed for fuels treatments. This article will make a few suggestions on ways to balance these objectives. If you live in a dry-but-forested area, such as eastern Washington, and are planning a thinning or harvest on your forestland, here’s a simple habitat acronym for you and any contractors you hire to keep in mind: SLLOPPS, which stands for snags, logs, legacy, openings, patches, piles and shrubs. Incorporating these seven features into your project will help reduce future risks of wildfire and insect infestation while promoting a healthy natural habitat for beneficial wildlife. In its natural state, the dry forest ecosystem experiences frequent low-intensity fires. This cycle of periodic fire results in tree stands dominated by large, old trees and, generally, not over-stocked with smaller trees and other growth as many stands are today. Historic photos of eastern Washington and Oregon show classic stands of old ponderosa pine (and some Douglas-fir) with riders on horses and wagons cruising through the open, grassy understory. These conditions did not occur everywhere, but the prevalence of ground fire at 7- to 15-year intervals ensured that these stands seldom suffered crown fires. Individual tree vigor was strong thanks to reduced competition for resources. Thus, fire disturbance helped maintain these forests. These stands contained large standing dead trees as well, and some enormous down logs that could survive low intensity fires. Regeneration was often patchy, resulting in numerous openings and areas of dense regeneration that might flash out in the next fire. Many shrub species are fire adapted, and after burning would either re-sprout in clumps, or sprout from seed in the soil, creating a vigorous shrub understory. Wildlife species, such as white headed woodpeckers and flammulated owls, are adapted to this open forest and its plentiful snag and log habitats and rich understory of shrubs. Native Americans are believed to have played a significant role in the fire ecology of the inland Northwest. Their activities led to the landscape-shaping fires that produced the stands encountered by the early European settlers to this region. Also during this time, lightning fires often would burn until season-ending weather events such as snowfall. Logging (until very recently) in these dry forests usually removed the large, excellent quality trees. This was economically advantageous but ecologically unfortunate, as these trees would have been the survivors of the fires. Without recognizing what we were doing, we removed the backbone of the dry forest habitat. The biology of dry forest tree species involves producing large numbers of seeds to give a chance for a few to survive the inevitable fires. Fire suppression efforts that began in the early 20th century inevitably led to the dense stands that we see on the landscape today. Now, we are aggressively thinning across the landscape, where funding, motivation and political will let us. Unfortunately for wildlife, caution over “fire safe” and “forest health” can lead us to produce stands that are simply “too clean” and “parked out” to serve as quality wildlife habitats. In this article, I will discuss seven tools — snags, logs, legacy, openings, patches, piles and shrubs (SLLOPPS) — that can provide some habitat diversity while addressing the issues associated with overstocked stands and tree mortality due to stress and insects. SNAGS: Some of the most important habitat features in any forest are made of dead wood; specifically, standing dead trees (snags) and down logs. Live trees with dead portions of their stems and branches can also fill this role. Insects reside in the dead wood, often feeding on fungi, while woodpeckers, nuthatches, chickadees and other birds feed on these insects. Cavities created by woodpeckers during regular nesting and courtship behavior can provide homes for secondary cavity species such as bluebirds or flying squirrels. Because many of these species are voracious feeders on insects, including some that are forest pests, their presence helps to keep the forest healthy but only if suitable habitat is provided so that they can occupy territories for feeding and nesting. DNR’s cost share thinning projects target dangerous fuels which are generally woody stems less than 3 inches in diameter. These smaller stems will carry fire quickly and spread flames into crowns. Larger wood, which ignites more slowly and creates less flash hazard, can be left for habitat and soil enrichment. Snags should be greater than 10 inches in diameter at breast height (dbh) in order to provide opportunities for large excavators, such as the hairy woodpecker or flicker, to create cavities. Natural snag densities vary tremendously, so the best policy for habitat is to maintain all snags greater than 10 inches dbh, and protect them from firewood and timber harvests. Forest practices laws in Washington state require 2 wildlife trees per acre; although this is likely not a biologically optimum number, it can serve as a target for forest management. Following this rule could include creating 2 snags per acre where they do not exist. Optimum snag densities are closer to between 12 and 16 snags per acre but in managed forests this is a hard number to reach. LEGACY: Big trees are the backbones of dry forest ecology. Keep large trees, including defective ones. They will produce more cones and branch surface area than younger stems, provide perches and nest sites, and will become future dead wood. LOGS: Logs can be treated the same as trees by emphasizing the protection for all large pieces by preventing them from being piled or burned, and by leaving them in place. Scattering tops and large pieces of unmerchantable wood across treated units are additional desirable actions to improve habitat. OPENINGS: Wildlife also benefits from openings—areas within the forest where all, or nearly all, of the overstory trees are not present. These openings allow shrubs and grasses to flourish as wildlife forage. Natural meadows are the best candidates for these areas, but openings also can be embedded within stands to allow big game animals to feel secure and to provide habitat for other wildlife associated with edge habitats. PATCHES: Denser habitats made up of young conifers and shrubs provide quality habitat for many species, such as feeding or nesting songbirds, and as browse and cover for big game. Retaining small patches of trees in thinning units can provide this habitat, but it requires forethought and follow through. Before thinning, mark areas from 30 to 50 feet in depth, and at least the same distance in length, or preferably longer. These areas should be left unthinned, (or thinned lightly), in order to maintain shrubs, trees and other mid-level vegetation while providing cover for large mammals such as deer, elk and bear. These patches should be configured across forest units so as to break long-sight distances, and staggered at distances of 200-300 feet apart. PILES: Wood piles can be left as distinct habitat elements and act as surrogates for down wood. They will provide cover for many species of wildlife. The best approach to creating piles for wildlife involve placing at least three to five layers of larger logs that are crisscrossed, or laid lengthwise in triangular arrangements. When covered with a few layers (about 2 to 3 feet deep) of fine branches, the pile will provide habitat with small interior spaces. Habitat piles also can be used as a non-burning solution for managing slash. Place piles constructed for wildlife away from overhanging trees so that if a pile should catch fire it will not act as a ladder fuel to the crowns. It’s best to provide these wildlife piles at a rate of two to three per acre, preferably in clusters away from roads, trees and structures. Because these piles are not intended as sources of firewood they should be marked for retention after the thinning work is done but before other brush or slash piles are burned. SHRUBS: Many shrub species provide excellent fruit and vegetation for many types of wildlife. Ask your local U.S. Conservation District office which shrubs are the best for your area. Elderberry is always a good choice, as is most anything else with “berry” in the name. A general rule of thumb for 10 to 15 percent of the project area to be made up of one, or all, of these desirable wildlife habitat elements. Providing patches of habitat for cover, or around a feature such as a snag, can provide much in the way of habitat diversity and reduce the potential impact of thinning projects on the diversity of animal and plant species that live in your forest. If done thoughtfully, thinning projects that maintain snags, logs and shrubs a sufficient distance from overstory trees will provide quality habitat while improving the health and resilience of dry forest stands. Work closely with contractors and be very specific as to where these habitats are to be provided. Thinning will increase resilience to both fire and insects through improved individual tree vigor, which in turn benefits many wildlife species. Risk of catastrophic loss of entire stands can be avoided with good projects too. And that benefits wildlife in the long term. 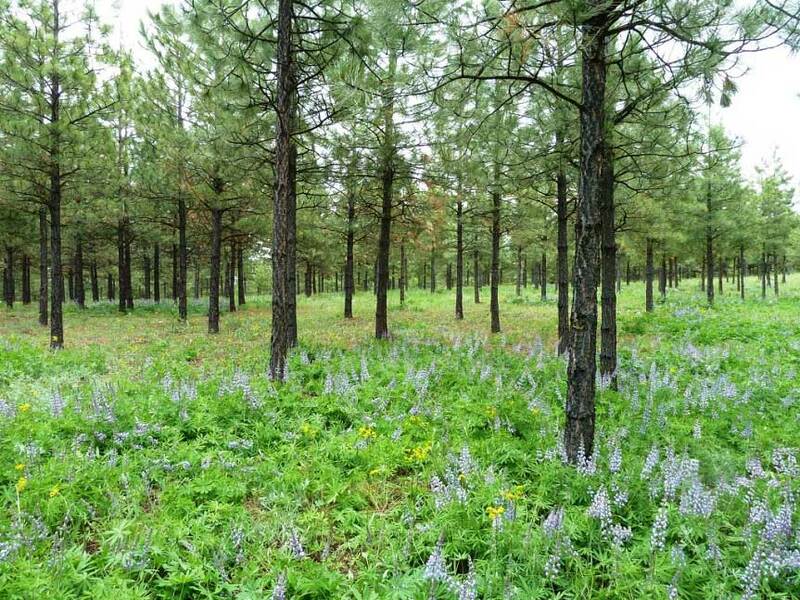 In 2015, Suzanne Wade of the Kittitas County Conservation District (KCCD) partnered with private landowners at Swauk Pines, a new 50-acre development near Cle Elum made up of 3- to 8-acre parcels in a dry pine forest. The Taylor Bridge fire (2012) came very close to this area and created significant motivation for landowners, some of whom had already built residences while others were in the planning stages, to reduce their wildfire risks while maintaining wildlife habitat. BEFORE: Swauk Pines development near Cl Elum before forest-thinning treatments. Note the many small (less than 8” diameter) trees, trees with low branches and the heavy woody understory–all prone to spreading fire. Photo: Ken Bevis/DNR. 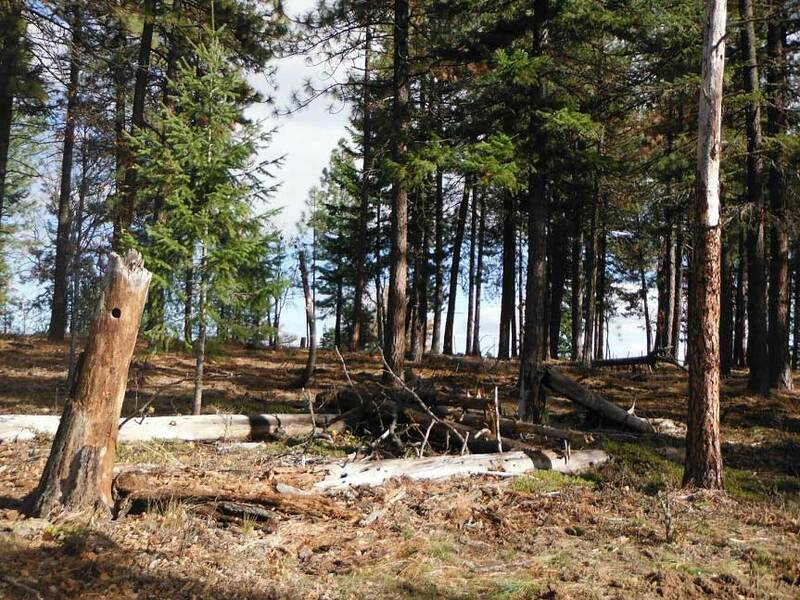 Most of the development was treated in a cost share project in which the KCCD worked closely with the thinning contractor to incorporate SLLOPPS principles into the forest treatments. These treatments included retaining large snags and logs, and including shrub patches. A bird survey was conducted before the project began to identify where to create open patches attractive to nesting birds. As a result of the strategic approach to forest thinning, habitat quality was maintained, fire risk was reduced, and forest health improved large. Homeowners were asked to take responsibility for the areas immediately around their houses. This project is an excellent example of successfully implementing multiple objectives. Including these habitat elements in thinning projects is only the beginning. Vegetation always grows back so the job of maintaining the levels of fuels acceptable to individual landowners is an ongoing task that will need to be revisited every few years. Thinning and fuel reduction projects are crucial to help our forests survive the current rounds of drought and devastating wildfire. Including habitat elements in these projects is not only possible but an additional benefit of meeting our fire and forest health objectives.